Discovered by Abbe Nicholas Louis de Lacaille on September 14, 1751. 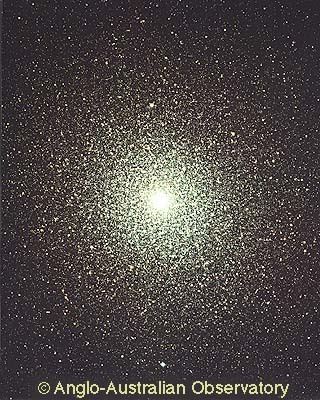 NGC 104, better known as 47 Tucanae, is the second largest and second brightest globular cluster in the skies, outshone only by another southern globular, Omega Centauri (NGC 5139). As its name "47 Tucanae" indicates, this object was first cataloged as a star and numbered the 47th in Tucana. Although a conspicuous naked-eye object, it is situated so much south at its declination of -72 deg, that it was not discovered as a deepsky object before 1751, when Abbe Lacaille cataloged it in his list of southern nebulous objects. Next to observe and catalog it were James Dunlop in 1826, and John Herschel in 1834. The stars of 47 Tucanae are spread over a volume nearly 120 light years across. At their distance of 13,400 light years, they still cover an area of the sky of about the same apparent diameter as the full moon, about 30 minutes of arc. Globular cluster 47 Tucanae is approaching us at roughly 19 km/s. The image in this page was obtained by David Malin with the 3.9-meter Anglo-Australian Telescope. This image is copyrighted and may be used for private purpose only. For any other kind of use, including internet mirroring and storing on CD-ROM, please contact the Photo Permissions Department (photo at aaoepp.aao.gov.au) of the Anglo Australian Observatory. In John Caldwell's observing list. In the Astronomical League's Southern Sky Binocular Club list. Caldwell 106 in Patrick Moore's list.